When it comes to cardiovascular activity for weight loss, elliptical machines offer a challenging aerobic workout for beginners and experts alike. Elliptical machines combine cardiovascular activity for weight loss with balance training for increased stability. The end result is a holistic workout that provides benefits beyond your shrinking waistline. If you're new to elliptical machines, speak with a trainer to learn how to use the machine safely. Elliptical trainers simulate the act of walking, jogging or running by supporting your feet on individual rotating pedals. Many elliptical machines also come with moving handlebars to engage your arms during your aerobic workout. The display panel on most elliptical machines provides a digital readout of your estimated caloric expenditure, distance, time, speed, heart rate and resistance. The digital display provides an easy-to-use estimate of your workout's effectiveness so you can better track your activity level for optimal weight loss. Newer models also include a docking station for your digital music player and speakers or input for a headset. For cardiovascular benefits and weight management, 20 minutes of moderately intense elliptical training five days a week will suffice for most healthy adults. For weight loss, the American Heart Association recommends at least 30 minutes of moderate- to high-intensity aerobic activity at least five days per week. Intensity levels are dependent on your level of fitness; a more fit person requires higher speeds or resistance than less fit people to achieve high intensities. Consult a heart rate chart to determine your target heart rate; exercising at 50 percent of your heart rate maximum should be considered moderate intensity, with 85 percent considered high intensity. To lose one pound of fat you must create a calorie deficit of approximately 3,500 calories. Monitoring your estimated caloric expenditure on your elliptical machine can help you keep track of how many calories you've burned. 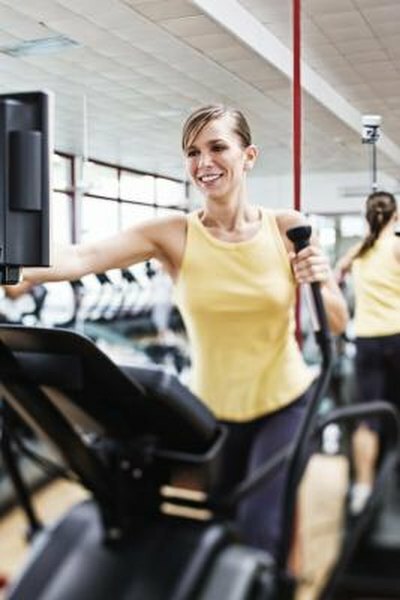 Though all elliptical workouts simulate the act of jogging to burn calories for weight loss, a range of speeds and resistances offer dynamic and varied options for personalized workouts. Beginners might opt for a simple walk/jog workout. Begin at a comfortable walking speed for five minutes and increase the speed for 30 to 60 seconds at a jogging pace before returning to walking. Repeat until you complete a 30-minute workout. For a higher-intensity workout that burns more calories, create an interval workout in which you intersperse high-demand, fast-paced bursts of work within a moderately paced workout. Instead of jogging in short bursts, bump up both your speed and incline or resistance to bring your heart rate close to the top of its target rate. Endurance workouts are also an option for burning calories for weight loss. Endurance workouts focus on maintaining your heart rate within its target heart rate zone for extended periods of time, usually between 60 and 90 minutes. Elliptical workouts are an effective means of burning calories for all-over weight loss. The average 155-pound healthy adult can expect to burn 335 calories during a 30-minute, moderate-intensity elliptical workout. Increase the incline or speed on your elliptical to increase your caloric expenditure. Elliptical machines are also particularly useful for people who experience lower body joint pain. Traditional jogging or jogging on a treadmill places stress on ankles, knees and hips during the downward impact. A 2007 study published in the journal "Medicine and Science in Sports and Exercise" reported that elliptical training results in decreased pedal reaction forces that translated to reduced stress in joints and increased flexion in knees and hips. Though the estimated caloric expenditure displayed on an elliptical monitor offers an estimate of the calories you've burned during a workout, trainers advise that the estimates may overcalculate the calories you've burned and fail to take into account important factors like weight and age that impact your metabolic effectiveness. For the greatest weight loss benefits, opt for an elliptical trainer that is equipped with moving handles so that you can engage your arms during your workout for more effective calorie burning. Elliptical machines are not recommended for people with back or balance problems because they require considerable coordination during the exercise.